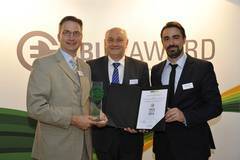 For the second time, the EBUS Award, i.e.the German Environmental Award for public local transport, was given to successful ebus projects and innovative products. The prize is awarded by Forum für Verkehr und Logistik, founded by the Association of German Transport Companies (VDV) and insurance company DEVK. An expert panel under the patronage of German Federal Minister of Transport and Digital Infrastructure Alexander Dobrindt.chose from numerous forward-thinking technical solutions and concepts for their operation. 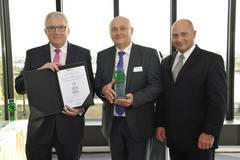 Leipziger Verkehrsbetriebe were honoured for their concept of employee motivation, training and workplace safety. ABB Automation Products GmbH won in the categories "innovative components - drivetrain" and "innovative components - charging technology". In the latter category, Bombardier Transportation GmbH was also honoured with an award. Spheros Europa GmbH succeeded in the category air-conditioning and Braunschweiger Verkehrsbetriebe were first in "operational use of battery buses".